Despite the fact that it is poisonous, ackee is the national fruit of Jamaica and the star of popular home cooked dishes. This bright red berry grows on a tree that has its origins in West Africa. Purdue University notes that the fruit grows in other Caribbean islands, such as Haiti and the Bahamas. It also grows in Florida and South America. Jamaica exports the fruit to the United Kingdom, mainly for consumption by expatriates living abroad. The ackee's scientific name is Blighia sapida, and it is a member of the sapindaceae plant family. Since the tree has traveled widely, in some places it has a different name. These include akee apple, vegetable brain, aki and variations in French and Spanish. The arils, or seed coats, have a slightly nutty taste. 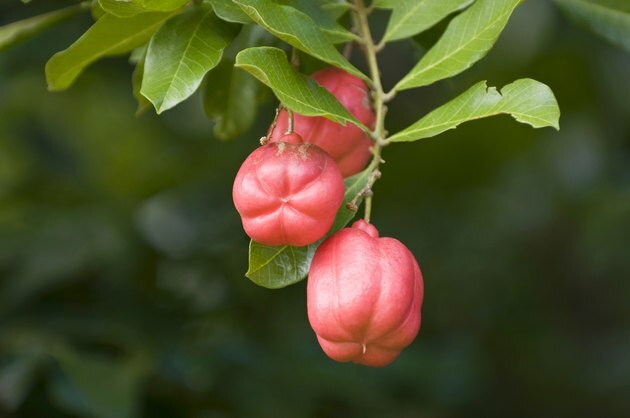 The seeds of the tree's fruit are poisonous and you cannot eat the pulpy aril inside the ackee fruit until it matures. Once it splits open naturally and the arils are exposed to sunlight, the arils are no longer poisonous. The Pan American Health Organization, PAHO, says that the ackee is a good source of stearic, linoleic, and palmitic acids. These fatty acids make up 55 percent of the total fatty acids in the ackee and provide a readily available source of fatty acids in the traditional Jamaican diet. It has no saturated fat or cholesterol. A 3.5 oz. serving of ackee weighs 100 g and has 151 calories, with 9.5 g of carbohydrates and a protein content that ranges from 2.9 g to 8.9 g, according to the University of Florida. The main vitamin in ackee is niacin, ranging from 1.1 g to 3.9 mg. Ackee has 30 mg of vitamin C and trace amounts of folacin, riboflavin and thiamine. It contains 270 mg of potassium, 98 mg of phosphorus, 35 to 83 mg of calcium and up to 5 mg of iron. It has 1 mg of zinc along with 240 mg of sodium. The poison in ackee seeds and under-ripe arils causes vomiting followed by convulsions. The side effects can result in a coma and death. The PAHO states that the amino acids hypoglycin A and B cause the fruit to be toxic. The hypoglycin content diminishes after sunlight reaches the mature arils. Purdue states that people who eat ackee often parboil the arils in milk or salted water, then sauté them in butter. In Jamaica, ackee and salted codfish is a popular breakfast dish. They also get added to stews and are eaten with vegetable dishes. In some countries, people curry ackee or eat it raw. What Is Noni Seed Oil Good For?